How to Flatter Boyish Figure. Girls with a boyish figure often long for feminine forms. The key to achieve your goal is to know the style tips that flatter a similar body type. These guidelines will lead you through the basic changes you have to make in your wardrobe in order to boost your confidence. 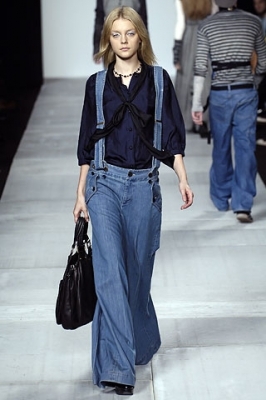 The catwalk is populated with androgynous boyish figures. Indeed girls who lack feminine forms often embody the ideal model to bring out the best of fashion guru collections. There's no need to panic if your body shape lacks the oh-so-popular curves. There's always a solution to still look attractive and ladylike in a few steps. Opting for basic outfit items that flatter a boyish figure is not so complicated especially if you dedicate enough attention to the critical spots as: hips, shoulders, waist and bust. Here are the basic ideas to create the illusion of a curvier body. The boyish body shape often means small chest and broad shoulders. In this case you are the lucky one to sport tops with all kinds of decorations as laces, dense patterns, and puffy sleeves as well as horizontal lines. These are the best combos that can add feminine lines to your figure. Wraps and halter tops work just as fabulously since the trick to create the proper balance between your flaws and fortes is to shift the attention to your slender waist. Floaty fabrics matched with a tighter waistline is a smashing ensemble. If you are keen to wear the new trends of the fall, you'll find out that it's not that hard to look voguish. Loose sweaters and fine fitted tops will do your body type a great favor and can add a womanly flair to your look. Athletic figures are in great need of refined and classy lines. The pros highly recommend you to select from the extremely colorful and creative range of dresses when it comes of formal outfits. However it seems that your best choice will be the tulip dress that will pinpoint the nice and slim waist and will camouflage the sporty legs. With a few moves you'll be able to fake the almost perfect hourglass figure. Baby doll dresses topped with a wider and voguish belt on the waistline will do miracles with your attire. Your most important aim should be to emphasize your strong and flattering features. The indicated dresses will turn your boyish torso and lower body into a gorgeous and above all, curvaceous figure. Coat dresses, trench dresses and halter ones are also A-list options. Loose-fitted is the buzzword when it comes of the ideal pants designed for boyish figures. The trick is to hide the straight lines and fake the feminine forms. Fitted pants and jeans can easily spoil you look if you go for them. Jeans and pants in general should not follow your silhouette. The narrow hips and slim legs are to be masked when choosing a flattering outfit. 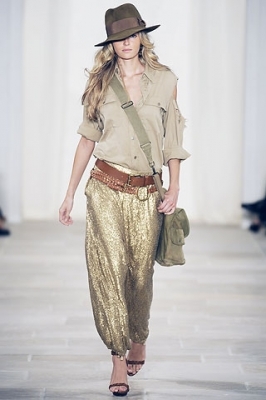 Wide leg pants are not only ultra-pop and stylish this season but also extremely flattering to a boyish shape. These especially if brightened up with back and side pockets will add the vital volume to your tooshie.